In the past we've shared some lovely 3DS hardware designs that are often rare and limited to release in Japan or other out-of-reach territories — some of the best examples are the iQue 3DS XL models released in China, too. It seems that the red and white Mario model from that iQue range will be an option for North American gamers, albeit in a rather quirky circumstance. Well-known retailer play-asia.com, that friendly home for import enthusiasts, has listed the model above for pre-order. Although it's likely to be targeting territories in Asia in terms of mass market sale, it's actually rocking the US build and system OS — if the listing is absolutely correct. As a result it'll play North American region games. The Western market clearly isn't the target here, as it comes bundled with New Super Mario Bros. 2 and Pro Evolution Soccer 2011 3D, the latter of which it's safe to say would not be included in a product marketed by Nintendo of America. It comes at a price, too, as pre-orders cost $299.99 as opposed to the standard $199.99 for a standard 3DS XL model from a typical retailer in, for example, the US. Are any of you keen collectors interesting in putting down the cash for one of these when they arrive in July? I hope they release a limited edition Smash XL. I'm not sure I'll upgrade to XL but if I do it'll be the Yoshi one. This one does look nice but I've always been more of a Yoshi fan, also I'm a bit concerned that not owning an XL will make for a bad Smash 3DS experience. preloaded with some soccer game? /me runs awayyy!!! As a grown man I really wouldn't mind being seen in public w/ that design. Though I'ld tell people it was the "Mario Italian restaurant edition", not "white". But I can't imagine the 1st time ever that SSB appears on a handheld it doesn't get a bundle. Has there ever been a game bundled w/ both 3DS and XL w/ a similar hardware design? SSB might be a good place to start. A region free 3DS XL? Sold! So wait... is this region free? I have quite a few Japan games I've been really wanting to play that likely won't make it over here. Too bad I don't have that cash, I'd certainly snap it up for that reason alone. And I think the restaurant design is cute! @PrincessSugoi Technically, it doesn't sound 100% region free. The article pointed out that the system will be able to run North American games so it doesn't quite sound like other regions are in the same boat... yet. Who knows though; maybe the list of regions will grow as we get more information. I love you, Mario White Edition. Why you cost so many moneys??!! One of my favourite 3DS designs of all time. Imported the same skin but with the black outlines for my 3DS XL a while back . Was tempted on a purchase for this via play.asia.com. However, I can't justify the price tag just to play Rune Factory 4. I think that's maybe for South American, South Asia or Mid-East market. When someone buys it, plays it with NA games and takes screen shots of said games working on the system…..then and only then, will I consider it. 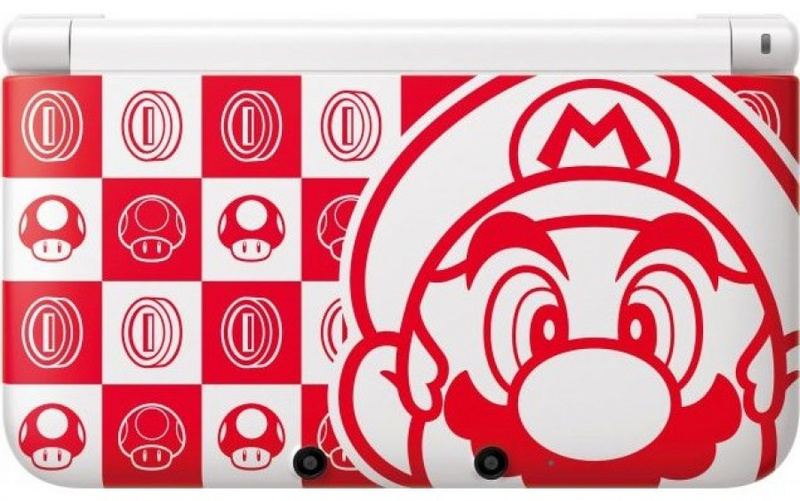 I really like the design of this 3DS XL. I wish I could just buy the system without a bundle of games I don't want. Seriously considering this once more info is out. It's already sold out!! Dang!!! WT frig! Already? Snap….I guess people are believing it's usable in NA. It looks awesome. I want a second XL so I can play with my wife/friends. However, I don't want a regular one. I want a limited edition one. i did an unboxing of this 3ds check it out!